I bought a Playstation 2 because of Ico. It proved to be a good choice; I absolutely loved that game. It reminded me of dreams I used to have in which I wandered through strange architecture. And the relationship that develops between Ico and Yorda really captured my emotions. I’d never had a game that made me feel responsible for someone. So of course I was excited about Shadow of the Colossus. And while I missed the camaraderie of Ico, especially with the vast emptiness that greets you in SOTC, the concept was daring, the gameplay was more exciting, and the story itself was deeper. In order to win the game, you, who had just faced insurmountable odds sixteen times in a row, had to just give up. So yeah, I was really looking forward to The Last Guardian. And I was really looking forward to it for years. And years. So long that I kind of lost enthusiasm. But then it was finally released and I waited to hear the praise. And basically there were crickets. Sure, I read a few reviews from the normal sites, but the excitement that was generated by SOTC just wasn’t there. Still, I wanted to play the game. So, now, I finally have. Yes, the game is beautiful. Yes, it’s dreamlike and vast. But it seems less thought through than the other games. For instance, your character, a young boy (as in Ico), gets knocked unconscious twice in a row right in the beginning of the game and again a third time not long after. And this recurs over and over and over, with you, or both you and Trico (the creature you befriend), falling and getting knocked unconscious. It seems like that could have been edited a bit. Overall, the game is more in the mold of Ico than SOTC. While you do hold onto a beast’s back, climb vines, and leap pillars that remind you of the ones in SOTC, the story is about a trapped young boy who must set another individual free so that the two of them can solve a series of obstacle puzzles to escape a huge and decaying castle. Basically, it’s Ico with Agro from SOTC merged with Yorda and blown up to the size of a house. And so the game, while being beautiful, feels a bit like a step backward. The (completely avoidable) frustrations of the game also add to this feeling. The first annoying aspect to the game is the camera. First, it seems set too close to the main character. There’s no way to reset this or vary it as far as I could tell, and so your view of the wonderful environment is hampered by the close perspective. Then of course there’s the camera’s movement. It tries to fly around you as you move and sometimes gets caught in certain places, or crosses the axis of the action abruptly, causing you to have to switch the direction you’re moving the joystick in. It also suddenly decides to move on its own, usually when you are carefully trying to line up a jump. Really, I haven’t experienced such an annoying camera since the early days of Tomb Raider. When people say that The Last Guardian feels more like a PS2 game than a PS4 one, I think this is one of the things they mean. Then there are the controls. They weren’t too bad a first. But problems cropped up soon and got worse in the last half of the game, as if all the bugs weren’t worked out. Most of the issue, besides being unable to tell what ledges were actually grabbable, is the redundancy of the controls. For instance, there’s a push button, which is only useful a handful of times in the game, but when you walk into something, you automatically start pushing. Why make it automatic and also have a button? Also, when you push and something doesn’t move, you end up pushing yourself backwards and falling over. Which means that any time you walk into something too hard, you fall over. I get that the character is a kid, but this got pretty annoying. It happened when I tried to jump, too. If I hit something that I couldn’t grab, I’d fall over. Yet the biggest issue I had was with getting on and off Trico. This may be partly my own inadequacies, but it’s also, again, the button choice. The jump button and the hold button are the same button, the triangle. So this means I would often try to jump off Trico and would instead hop a bit and then cling back on to him. It got pretty annoying, especially in situations with a time constraint. And in fact, I never found a graceful way to dismount Trico. Still, there is a palpable sense of partnership that develops between you and the huge creature that has come to trust you. While I loved Ico, Yorda was not much more than a key and you had to look out for her much more than she helped you. Well, in TLG this is almost reversed. Trico is much more powerful than your character is and much of the game involves removing obstacles so he can do what he needs to do. You play support. And I have a feeling that this may be what caused some people to get so frustrated with Trico. 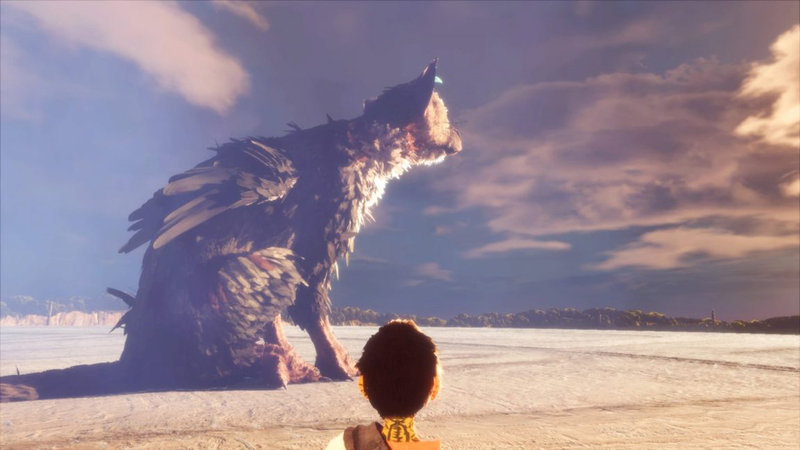 I’ve read reviews where people said they spent long periods of time trying to get Trico to do what they wanted. While I found him to be stubborn on occasion, I didn’t really have this problem. Maybe because I thought of me supporting him and not the other way around. I just didn’t try to tell him what to do too much. Mostly I chose to pet him. I am not sure that this is what made the difference, but it’s entirely possible. Given that SOTC shows that all your work was probably folly and that to succeed you had to give up, I wouldn’t be surprised if the intention in this game was to make you more of a passenger than the driving force of the narrative. 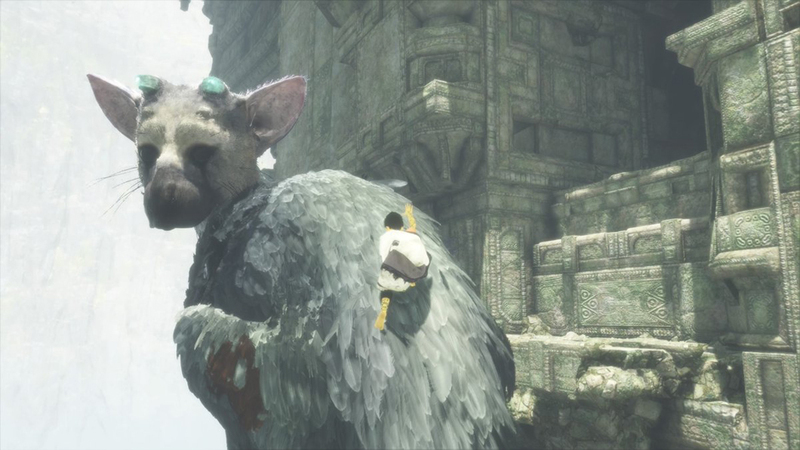 And again, the relationship that develops between you and Trico is touching and makes for some tender and sad moments later in the game. This magic of partnership, which Ico had, is also present here. Though the frustration of the game mechanics often cut the feelings short. The games ends with nostalgia, which seems apropos. The narrator of the game is the boy you are playing and at the end we finally see him grown up. A group of children have found the mirror that you use in the game and so you tell them the story. “I once had an adventure…” Which is exactly how The Last Guardian works for me, reminding me of the time I first played Ico. “I was once sacrificed to an evil queen and had to escape her crumbling castle, leading a sickly young woman by the hand…” In the end, I’m glad to have these memories.